Ok, with a month on the calendar already in for 2012, we're back this week with our second round of guru predictions for the upcoming year in supply chain, featuring as usual some of the top thinkers in the space. Last week, I featured several of the most interesting predictions from the analysts at Gartner and a few others, which you can find here. 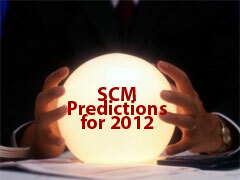 Predictions from Supply Chain Gurus for 2012. Simchi-Levi also believes that there will continue to be a trend towards "manufacturing moving closer to demand," or more regional sourcing strategies, as higher costs in China and concern relative to supply chain risk cause many companies to rethink their networks. We're finishing this off here this week, starting with some predictions from Simon Ellis and the rest of the supply chain analysts over the IDC Manufacturing Insights. Here's one I find interesting: Supply chain organizations will rediscover the need for differentiation, asking: What does my supply chain really stand for? Ellis says that in robust economic times, it tends to be less important for a given supply chain to clearly differentiate itself, as the rising tide lifts all boats. But in a weak or lackluster economy, such as we have had for nearly four years now, differentiation becomes more important. Linked to corporate strategy, Ellis says that while most companies need to be reasonably good at product, cost and service, in the end, there has to be a "first principle" among the three that really drives company success, and that therefore needs to drive the supply chain. He says that often, what a given supply chain is all about is not clear at all, and that you can get widely varying opinions across different managers on this topic within a single supply chain. Ellis expects more companies to begin re-focusing on this issue in 2012, and adjust supply chain strategies and investments accordingly. Now to some of the individual gurus we asked this year to prognosticate for us. My friend Gene Tyndall of Tompkins Associates says that "As the economy improves slightly, the question is whether the changes made by most companies to survive during the multiyear recession will continue as business as usual." By this he means aggressive cost reductions, lean practices, more outsourcing, and tight control of operating costs and investments. Will still be the norm, even if the economy keeps its slow improvement going? "I would predict for many, it will," Tyndall says. "The uncertainly, the risks, and the volatility are continuing. Most management teams have become risk adverse, and they will remain so this year." In other words, there really is a new normal for the supply chain. Tyndall also predicts that "Demand-driven supply chains strategies will expand." He says that "there simply is no way to grow profitably without transforming supply chains towards new demand-driven strategies and operations," and adding that "we need solutions that read POS in near real-time and drive supply back across the chain with dramatically improved lead times." Jim Barnes, president of consulting firm enVista, predicts that "As retailers look to increase comp [same store] sales, they will focus less on 'least cost supply chains' in favor of 'best managed supply chains.'" Now that's an interesting thought. Why this shift? Barnes said its because while a retailer "may save $.10 to move a pair shoes by optimizing their transportation they are missing out on $40.00 in gross margin opportunity by improving their in stock levels and therefore driving increased comp sales. 2008 and 2009 was about survival. 2012 is about improving the customer experience." He adds that those merchants which "are focused and reducing their “reaction time," or the time an item is sold to the time it back on the shelf will win the retail game. In 2012 and beyond it needs to be about speed to market, total cycle time reduction which eliminates variability, and therefore reduces inventory." My good friend and one of the smartest observers in the supply chain is Dr. David Simchi-Levi of MIT, and he says that "Some of the issues that started to move to the forefront in 2011 will likely dominate the attention of executives in 2012. What are those issues? Simchi-Levi says they include more attention to supply chain risk management and supplier performance monitoring. The two topics of course are linked, and with regard to the latter, he notes that "The demand for more supplier accountability, exemplified by the recent criticism of Apple in regards to work conditions at its contract manufacturer Foxconn, will require more focus on supplier performance monitoring. This of course is also part of effective risk mitigation strategies." Simchi-Levi also believes that there will continue to be a trend towards "manufacturing moving closer to demand," or more regional sourcing strategies, as higher costs in China and concern relative to supply chain risk cause many companies to rethink their networks. That may in part mean more work back to or staying in the US, but could also mean Mexico or other "nearshore" locations. Simchi-Levi also believes that the rebirth of "supply chain segmentation" strategies, which really just started to re-emerge in 2011, will gain steam in the coming year. He says that "With the proliferation of channels, products and different customer value propositions, many companies need to segment their supply chain strategy," noting the success of Dell in doing this, a transformation he was directly involved in making happen. 1. Freight rates will head higher in 2012 with an improving economy combined with continued asset discipline on the part of most carriers. 2. Shippers will retool how they approach transportation to become a "preferred shipper" with key carriers. "The easier it is for a carrier to do business with your company, the better your rates will be," Regan says. 3. Like Sinchi-Levi, Regan also believes that there will be a major focus on supply chain risk mitigation strategies, noting that as supply chains become more lean, "supply chain disruptions [like the Japanese earthquake/tsunami] have a disproportionate impact on a company's operations"
Marc Wulfraat, who now runs MWPVL consulting and is one of the industry's most insightful experts on matters related to distribution and fulfillment, says that the consumer goods and retail sectors really need to pay attention to what is happening at Amazon.com, which is growing revenues and distribution centers at an incredible pace. He notes that "Amazon now operates 26 fulfillment centers within the U.S. exceeding 20 million square feet with an additional 43 fulfillment centers other countries including Canada, the United Kingdom, Germany, France, Japan and China. In 2012, Amazon has plans to add 17 fulfillment centers globally (including India), many of which exceed 1 million square feet. Amazon is one of the few companies that has been on a massive hiring spree in an uncertain economy and by all accounts there is no signs of this growth tapering off." Wulfraat adds that many companies will rethink their decisions to outsource e-fulfillment operations, saying "more retailers are going to move towards self-distribution to gain better control over their supporting distribution operations" in e-commerce." He adds that "For the supplier community, it is becoming imperative to provide support for multiple retailer web storefronts and this involves a fair amount operational and technological complexity," including rapid drop shipping support if the retailer is out-of-stock or doesn't carry the product in its DCs. Ok, that's it for Part 2. I have only scratched the surface of these predictions, and frankly we have a few more tricking in. As always, we will post the full comments from these analysts and gurus in next week's On-Target newsletter - including my own predictions for 2012. Be sure to take a look. Any reactions to round 2 of our supply chain predictions for 2012? Let us know your thoughts at the Feedback button below.